Over time, the buildings (structures) become subject to demolishing. Usually, these are ramshakle, dilapidated buildings, which are already dangerous for further use. In some cases, the demolition of buildings is conditioned by the intent to build another structure on the site, which is more profitable and advanced. To facilitate safe dismantlement of buildings and in order to prevent the harmful effects of the collapse, a system for measuring the intensity of seismic impact is used. Before demolishing a building, it is obligatory to perform preliminary calculations to avoid dangerous situations that can cause deformation or even destruction of the nearby buildings, utilities, pipelines, etc. The preliminary calculations are also required for further application, i.e. if several identical or technically similar (height, weight, construction materials) buildings are to be demolished at different locations. – PC or laptop (for convenience of use on the site). At the places of potential seismic activity (according to preliminary calculations) or for monitoring purposes, VS 1313 seismic receivers are installed and connected with a cable to ZET 048-E-16 seismic recording system (seismic station). VS 1313 seismic receivers transmit the output signals to ZET 048-E-16 seismic recording system for processing, and then the processed signals in the form of results of the maximum value of vibration velocity and vibration acceleration are displayed on the screen of PC (laptop) with preliminary installed specialized software. Let us consider a case of integrated demolition of an elevator. The elevator to be demolished is located in the field, while VS 1313 seismic receivers were placed according to preliminary calculations: two on the foundation (brickwork) and two on the slab on the ground surface according to the receiver layout. The elevator was demolished after using an excavator to cut the structure supports. According to the report on completed elevator demolition works, VS 1313 seismic sensors recorded the signals of vibration acceleration that reached the maximum value at the time of elevator collapse. 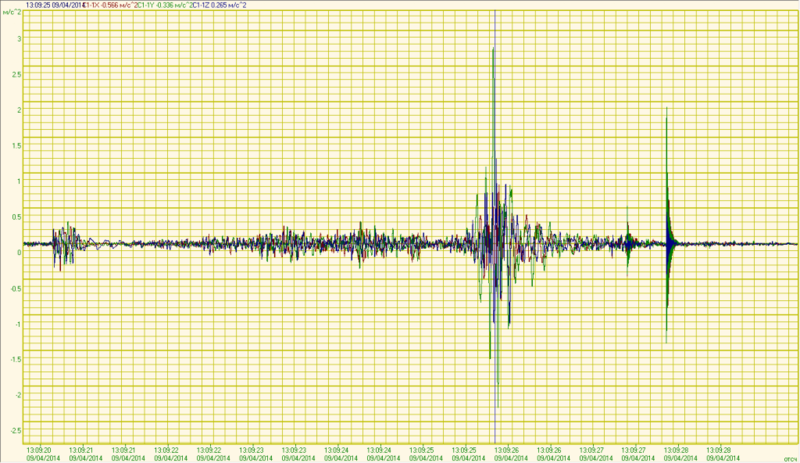 The signals were transferred for processing and calculation of values to ZET 048-E-16 seismic station. Thus, we conclude that the equipment of the system for measuring the seismic impact is able to capture the signals of maximum value of the vibration velocity and acceleration in terms of the seismic activity, which occurred due to the elevator collapse, providing the grounds for further use of the obtained results in similar works. Namely, the obtained and confirmed calculations can be used for demolishing the similar structures of the same height, weight, etc., given the established seismic resistance of nearby buildings, utilities, etc. In simple terms — whether the facilities located near dismantling site can withstand the seismic activity resulting from the demolition. The entire hardware kit has a complete set of permission and operating documentation in accordance with all applicable standards. 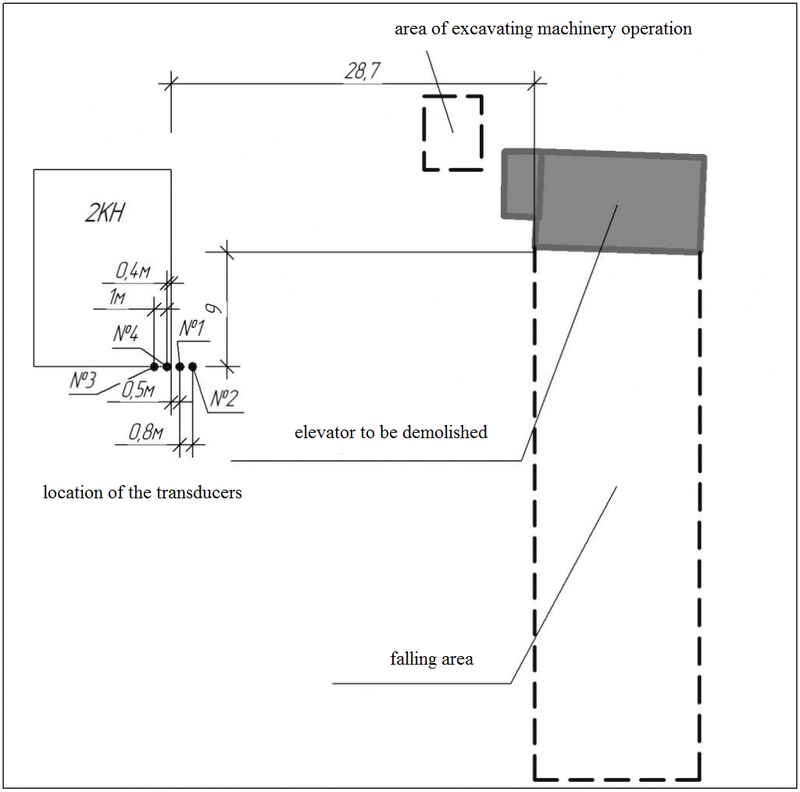 Layout of relative positions of the vibration source and measuring points. ZETLAB Company thanks Volgaspetsstroy enterprise for providing the materials used in this article.